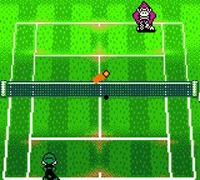 A portable tennis game starring Mario and friends. As a new recruit at the Tennis Academy, your aim is to climb your way through the classes and beat the champion players. The main game features RPG elements as you and your doubles partner learn more about tennis, issue challenges and take part in minigames to level up and improve your stats. You can connect two copies of the game using the Game Boy Link Cable to challenge another player with your characters or a line-up of Mario characters, or connect to Mario Tennis on N64 to unlock secrets and upload your custom character to the game.